Twitter is announcing an expansion of its advertising insights platform to help it level up with its biggest competitors ahead of its big push to onboard more users. Earlier this year Twitter unveiled its secret weapon: Project Lightning, a new feature that could make the platform more relevant to broader range of users. Now the company is announcing a refinement to its advertising suite, including a new demographic targeting tool called Personas. 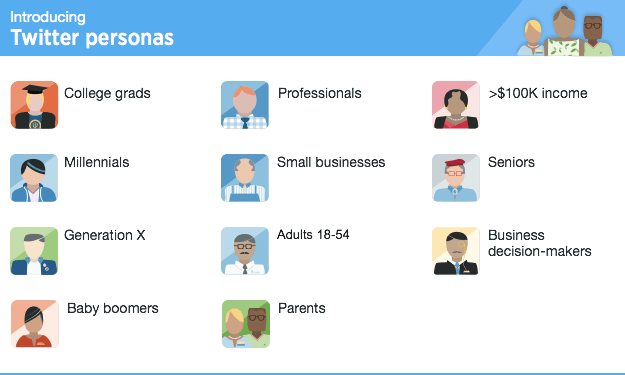 Personas is essentially a dossier on different groups of people that can be as broad or as refined as advertisers want to make it. For instance, an advertiser may want to target millennials with iOS devices. The tool offers ten targets including boomers, people who make over $100,000, millennials, college graduates, small businesses, senior citizens, adults 18-54, professionals, Generation X, and parents. Within that, advertisers can refine their search by tweaking information about lifestyle, language, consumer behavior, and mobile footprint. The tool is aimed at giving advertisers as much access to Twitter’s vast store of audience data without encroaching on an individual’s privacy. In addition to introducing Personas, Twitter has also upgraded its Campaign Insights and Tailored Audience Insights tools. Campaign Insights now gives advertisers the ability to compare insights on viewers who see a campaign against those who interact with a campaign. Advertisers can also see more information about people who bought a product through a campaign. Tailored Audience Insights is also getting a boost with information about people who have visited an advertiser site, interacted with their customer service platform, or engaged with a branded app. These refinements to Twitter’s ad platform all point to one goal: to make its data sets as hyper targeted as other major ad platforms on the market. Twitter lags behind Google and Facebook in terms of advertising revenue. Part of that is because the social feed has a smaller audience. But with big plans to grow that audience in the works, Twitter will be increasingly focused on making its ad platform as personalized, if not more so, than its biggest competition. Next articleThe next round of gadget leaks..